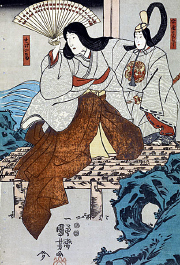 The "Funayagura" scene is the third scene of the second act of "Yoshitsune Senbon Zakura". 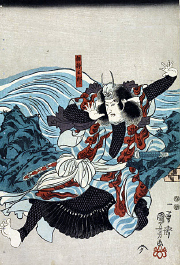 They are either staged independently of the rest, along with "Tokaiya" and "Daimotsu no Ura", of the play or as part of a tôshi kyôgen production of "Yoshitsune Senbon Zakura". Suke-no-Tsubone dresses herself and the child Emperor in their court robes, and they anxiously await news of the battle. Finally, Sagami returns with the news that things have gone badly for Tomomori. 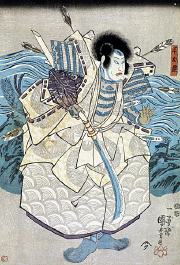 The Heike forces have been unable to avenge themselves on the Genji, and instead have been routed by Yoshitsune and his men. When Suke-no-Tsubone opens the doors and looks out on the sea, she finds that indeed the lights have gone out. Another messenger arrives, and after giving the news that their allies have been utterly defeated, he commits suicide. Suke-no-Tsubone explains to the child Emperor that they are now going to take a journey to a paradise beneath the waves, where they will be freed from the sorrows of this world. Just as they are about to jump into the sea, however, Yoshitsune arrives and stops them. Next scene: "Daimotsu no Ura"